Which closing wheels do you need? 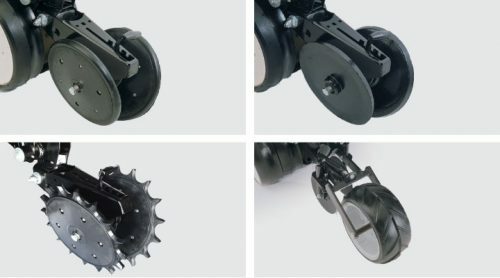 Choose from multiple closing wheel options that create superior seed-to-soil contact and precise seed placement across multiple soil types and tillage practices. These 1” x 12” rubber-tired plastic closing wheels firm the soil around the seed for excellent seed-to-soil contact. The dual position mount allows staggered or straight “V” mounting. The cast iron model is designed for consistent performance in heavy no-till, rocky or less than ideal conditions. All “V” closing wheels offer four-position, quick-adjust down pressure (0-145 pounds) and oversize double row ball bearings for longevity. This “V” closing wheel’s angular tooth design helps prevent clogging and promote consistent plant emergence. It works well in virtually all soil and tillage conditions. It’s especially effective in saturated or clay soils. This spiked closing wheel also offers a unique combination of sidewall crumbling and soil firming. Built-in depth control allows for use with multiple crops. The Furrow Cruiser Spiked Closing Wheel is also available on all Kinze planter models as a retrofit kit these closing wheels work best in sets of two for each row unit. This model features a double disc closing wheel with single press wheel. The chevron wheel creates a fracture line to enhance emergence in soil types prone to crusting. To learn more, visit your local Kinze dealer.